While visiting my family and celebrating my mom’s 61st birthday, I got a peek at some hardy winter Montana birds. My Aunt keeps a feeder out as she also enjoys identifying visiting species. This wasn’t specifically a birding trip, but part of the fun with this hobby I’ve found is wherever you go…birds are there. And traveling means ALL NEW BIRDS. Well, for the most part. You’re never too far from an American Crow, European Starling, or House Sparrow but it was neat to see relative birds from families that I see farther west. Similar, yet slightly different. 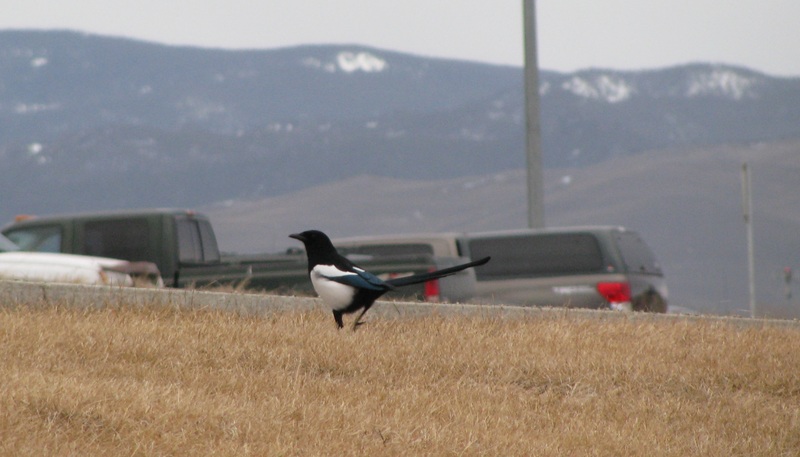 For instance, one common Portland Corvidae is the Western-Scrub Jay, but in Helena, the Black-billed Magpie takes center stage as the outgoing and raucous jay-relative. In my city I mostly see Black-capped and Chestnut-backed Chickadees, but the Mountain Chickadee is more prevalent east of my locale. This LBB (Little Brown Bird) looked sparrow-ish to me. We figured out which birds winter in Montana narrowing down the options, then the field mark in the last picture sealed the deal. The bird finally showed it’s dark central spot above it’s light-colored belly revealing it is the American Tree Sparrow. American Crow or Raven? hmm…. Even winter in Montana can produce a wide variety of bird sightings. I wonder what would happen if I traveled to the tropics? Some day I’ll fly south to check it out! This entry was posted in Birding Trips and tagged American Crow, American Tree Sparrow, Black-billed Magpie, Hairy Woodpecker, Mountain Chickadee, Red-breasted Nuthatch, White-breasted Nuthatch by audge29. Bookmark the permalink.